What is a student complaint form? A student complaint form is a written document or application that is utilized by students to communicate their grievances and complaints to the teachers and other higher authorities of the educational institution. 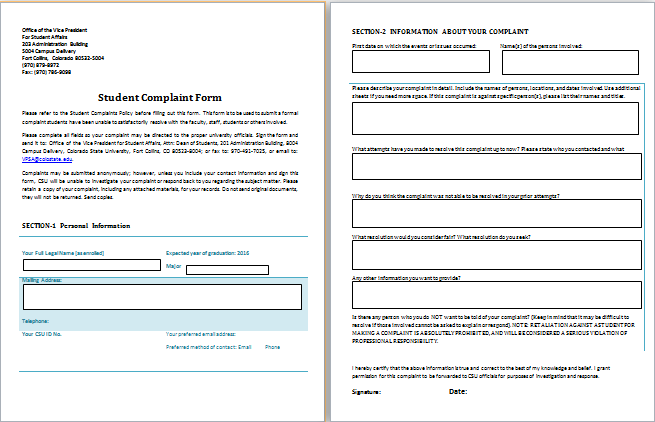 The student complaint form varies from institute to institute and may also have different versions for different nature of complaints. The student may have a complaint about the teachers of the institution or the other students. He may want to register a problem about the classroom or school facilities or any other issues that bother him or her in the premises of the educational center. His registration number and other details like contact data, registration no etc. Students have the leverage of procuring this form from the concerned department in the organization or the school bookshop that provides all the stationery and other educational stuff. Once they have mentioned the complaint in a precise and effective manner on the form and filled in all the relevant details needed, they can submit the form to the higher authorities or the designated person of the Institute. It should be ensured by the student to make the complaint based on truth and relevant facts should be provided along with it.